TaxiPRO is web application developed for taxi transfer companies. Back in 2010, we came up with an idea to develop a top quality software intended for taxi organizations. We called it TaxiPRO 1.0 and it is widely used by taxi firms as a replacement for notebooks and logs. An increasing use of the internet lead to an idea where transfer reservations should be made online. For these purposes we developed a brand new TaxiPRO v2.0, which offers visitors to make online reservations on taxi sites. TaxiPRO can be integrated into an existing website, or we can develop a brand new online reservation website in case the customer does not have one already. Making reservations by phone will still be present, while the dispatcher enters data into the application software manually. The application was initially developed primarily for German speaking countries, since their citizens showed the biggest habit of making reservations online. 1. Customer makes a transfer order via company website. 2. Audio and video notification about the new reservation is displayed for the dispatcher to see. 3. The dispatcher designates the driver to pick up the order (using a previously generated list with drivers). 4. The driver receives a notification about a new reservation on his smart device with necessary data (address, date and time, name of the guest, etc.). The application is able of storing necessary administrative data regarding the driver, vehicles, street addresses, pricing, as well as, generating statistics about transfers made and drivers, etc. In addition, it offers generation of PDF invoices for services made. 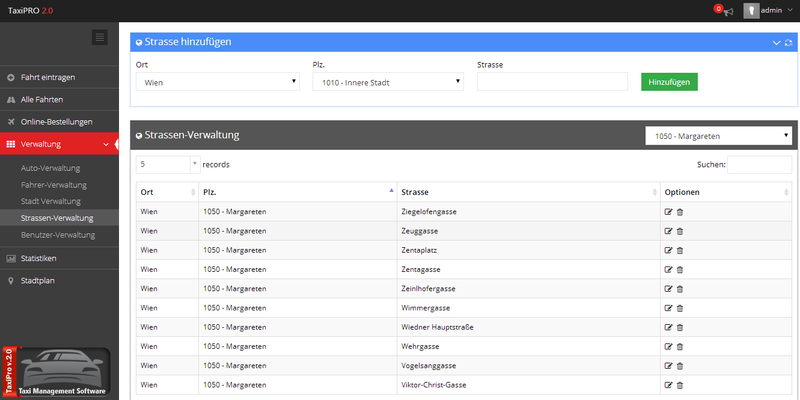 TaxiPRO already contains over 13.000 street names in Vienna. An administrator can always add more or change the existing ones!